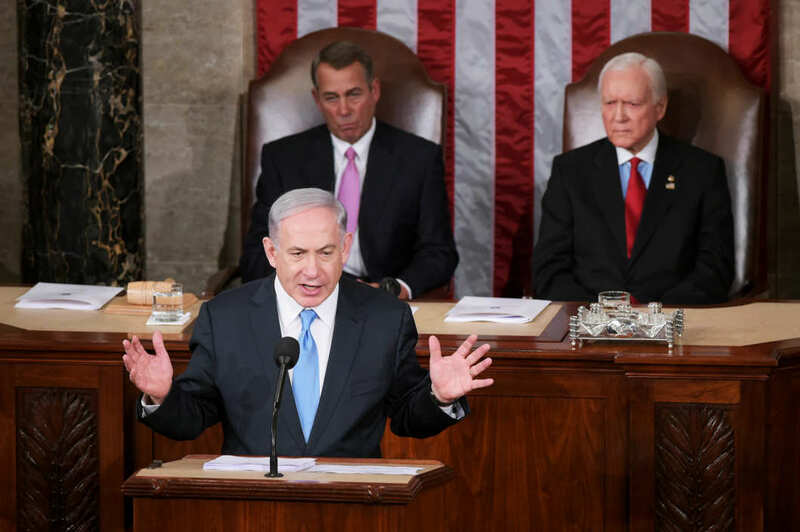 In a speech to the U.S. Congress, Israeli Prime Minister Benjamin Netanyahu warned the United States on Tuesday that a deal currently underway with Iran regarding its nuclear program could cause a “nuclear nightmare”, to which President Barack Obama reacted scathingly. Netanyahu’s critical opposition to Obama’s diplomacy towards Iran aligned him with the U.S. President’s Republican foes. In the Oval Office, Obama responded to his Israeli counterpart by stating that Netanyahu had “nothing new” to offer. The Iranian government, in response to Netanyahu’s 39-minute speech, denounced it as “boring and repetitive” according to the Islamic Republic News Agency (IRNA). In his address, boycotted by many of Obama’s fellow Democrats, Netanyahu stresses that Iran was “as radical as ever” and could not be trusted with a deal. 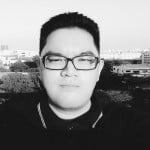 He claims that agreements proposed by the United States and other world powers would “pave its (Iran) way to a bomb” rather than blocking it. “It will all but guarantee that Iran will get those nuclear weapons, lots of them”, he said. 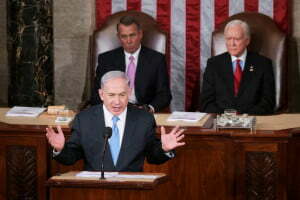 The speech delivered by the Israeli leader drew 26 standing ovations in the Republican-majority Congress. In place of the emerging deal, Netanyahu proposed broadening the scope of the negotiations by addressing what he deems as Iran’s “aggressive” stance in the region; a claim swiftly dismissed by Obama as Tehran’s de facto “regime change”. Yet despite stating that a nuclear-armed Iran would be a threat to Israel, Netanyahu shied away from pushing for further sanctions or a total rollback of Iran’s nuclear capabilities – an indication that Israel might settle for less. The U.S. President said that Netanyahu offered no “viable alternatives” to the ongoing negotiations. The Israeli Prime Minister’s speech triggered a diplomatic frenzy caused by his acceptance of a Republican invitation which circumvented the White House. Obama did not watch the speech, but instead read the transcript. His refusal to meet Netanyahu stems from what he says would be seen as interference should he meet his Israeli counterpart before the March 17 elections, highlighting the history of testy encounters between the two leaders. DemocraticHouse Leader Nancy Pelosi described the speech as “an insult to the intelligence of the United States” and was saddened by Netanyahu’s “condescension”. The absence of 60 out of 232 Democratic members of Congress was especially astonishing given its typical unity regarding Israel’s security. The boycott could have ramifications for Netanyahu at home as many Israelis are wary of estrangement from an ally which affords the country military and diplomatic support. Steve Scalise, the Republican House Majority Whip, called the Israeli Prime Minister’s address “a privilege” and expressed his shared concerns that negotiating with Iran would not prevent it from pursuing nuclear weapons capability. However former U.S. Ambassador to Israel Martin Indyk critiqued Netanyahu and said that “the prime minister should say not only what is wrong with the deal, but how to get from where we are today to a deal that he could accept. And we didn’t hear that in the speech. But you can’t beat something with nothing”. Next articleHBO Online Only Streaming Service Is Here! A Business Administration graduate who takes interest in current events and existentialism. He is often found browsing the weird and bizarre during his spare time.